We all watch TV - think of the difference in quality between regular channels and HD channels. ReedHD can help solve more crimes using less cameras due to increased image quality. A standard video surveillance camera records in 0.4 megapixel (720x480 pixels). ReedHD records in resolutions up to 29 megapixels (6576 x 4384 pixels) and gives you a better opportunity to record and recognize Faces, License Plates and Objects. Our industry leading 29MP camera gives you the same resolution as over 95 standard definition camerasAll of us have watched TV. 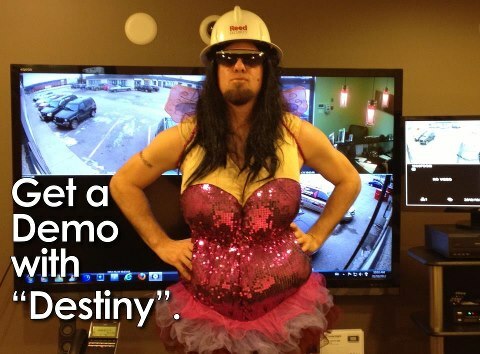 To get 10% OFF....ask for a FREE, No Obligation "Demo with Destiny". Contact Reed Security today for more information. We would be happy to help you. Local companies support local causes and when the opportunity came to support the Hospital Home Lottery Reed Security stepped up to the plate. This years $1.4 Million dollar grand prize showhome is Protected by Reed Security and features a Simon XTi interactive security system. Door sensors provide primary protection and motion sensors provide secondary protection with our layered security design. A loud 85 decibel siren lets unwanted visitors know it's time to leave an limits losses. Reed Security's 24/7 Rapid Response Monitoring Operators watch over the property and notify the proper authorities in the event of an alarm. The touch screen keypad is easy-to-use and has emergency buttons that can alert the Police and Fire Department immediately during an emergency. The touchscreen displays weather forecasts and can provide severe weather alerts. Please buy your ticket today and support a great cause. The lottery showhome is located at 9-602 Cartwright Street, The Willows.